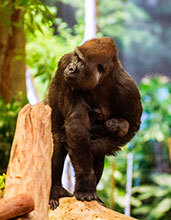 We’re pleased to announce the birth of a western lowland gorilla born November 24. The baby is a male, and was born to 12-year-old mother, Shalia, and 28-year-old father, Cassius. This is the first offspring of Shalia; and animal care staff report mother and baby are doing well. The rest of the members of the Zoo’s gorilla troop are curious, but respectful of the new infant, and are showing appropriate behaviors. Father Cassius is attentive and protective of the new addition. 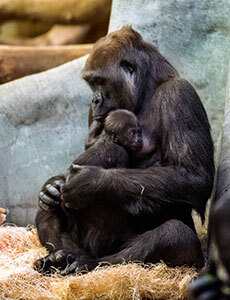 Female gorillas give birth to one infant after a pregnancy of nearly nine months. Unlike their powerful parents, newborns are tiny – weighing about 4 pounds – and able only to cling to their mother’s hair. These infants ride on their mothers’ backs from the age of four months through the first two or three years of their lives. Western lowland gorillas are critically endangered in the wild, but are more common than their relatives, the mountain gorillas. Western lowland gorillas live in heavy rain forests, and it’s difficult for scientists to accurately estimate how many survive in Cameroon, Central African Republic, Congo, Equatorial Guinea, Nigeria, Gabon, Angola, and possibly the Democratic Republic of Congo. It is the Zoo’s hope that mom and baby will generally be on public display Tuesdays, Thursdays and Sundays from 10 a.m. to 2 p.m. There may be random occasions when the newborn and mother decide to stay off public exhibit on a given day. Once Shalia and the baby become more acclimated to their indoor area, there will be additional days that visitors can see them on exhibit.